Purchase your polystyrene eggs from a craft shop. Mix purple paint with magenta and dark blue. Light green made with yellow and light blue paint. Orange made with yellow and red, mostly yellow. Light pink made with a small amount of red and mostly white paint. Paint eggs on on side with each colour. Paint both side again on side at a time for drying. Repeat again for the third time both sides. 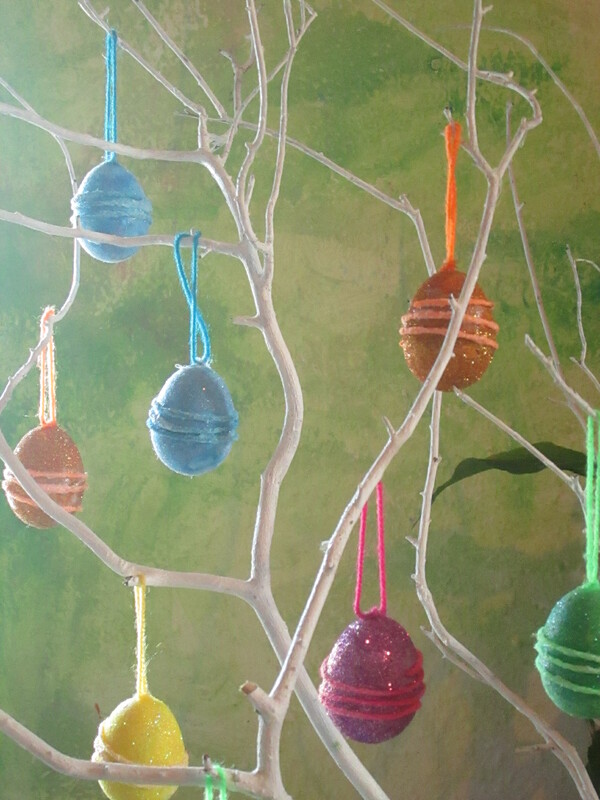 Cut a piece of wool 10cm long for each egg in coordinating colour. Glue one end to the top of egg. Glue other end to the top of egg. Cover bottom of each egg in P.V.A and sprinkle coordinating glitter. Hang on branch to dry. Then repeat with the top of each eggs. Cut wool in chosen colour and length. Cut a segemnt of wool in desired length. Then glue as shown and leave to dry by hanging on to your twig display.